Etching by Antonio Fantuzzi, 33 x 50.7 S, arched at the top (Vienna). I. Without an oculus in the center of cut stonework above, and without the clouds in the landscape. The only known impression of this state, in London, has torn away the small area where Fantuzzi’s monogram may appear in state II. II. 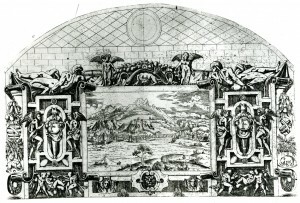 With an oculus and stonework above, with clouds in the landscape, and possibly with Fantuzzi’s monogram in the small, dark, arched area at the lower right. Bartsch, XVI, 1818, 349-350, 29, as Fantuzzi after some artist of the School of Primaticcio. 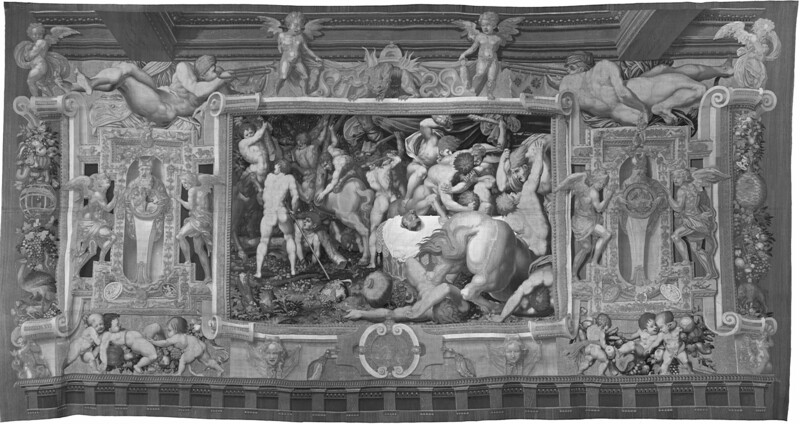 Herbet, II, 1896, 270 (1969, 66), 5, as Fantuzzi, after one of the frames in the Gallery of Francis I. Zerner, 1969, A.F.37 (Paris, Arsenal), as 1542-1543. COLLECTIONS: Berlin, 142-22 (II). London, 1862-7-12-499 (I, cut on all sides). Paris, Eb 14d (II, arch cut from top). Paris, Arsenal, Vol. 168 (1), no. 13 (II) (see Schéfer below). Vienna, H.B.XIII, 2, p.70, no. 430 (II), printed in brown ink. Schéfer, 1894-1929, col. 552, no. 13. Zerner, 1964, 75, as late 1542-1543. Zerner, 1972, 114, Fig. 171. Zerner, IB, 33, 1979, 249 (Vienna). Boorsch, in French Renaissance, 1994, 242, under no. 41, as arched at the top like another of his cartouches [RE.21], and hence as perhaps related, and perhaps not used or made for Fontainebleau. 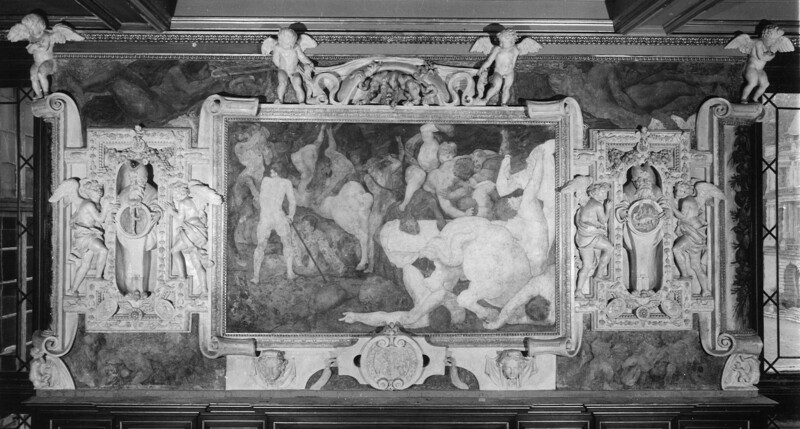 This etching is related to the framing of the Combat of Centaurs and Lapiths in the Gallery of Francis I (Fig.P.22, I S a). But it is also related to the tapestry in Vienna of this part of the gallery (Fig.P.22, I S,Tapestry, a) and to a drawing in Ensba in Paris (Fig.Masson 2490). The differences among all these works are specified in the catalogue entry of this section of the gallery (P.22, I, S). It is possible that the etching goes back to a drawing by Rosso or from his studio of a kind that is reflected in the Paris drawing, where, however, the herm holds a disc showing a salamander. The composition of the etching is almost exactly symmetrical except that the large nudes above play slightly different instruments. Thus, the print could correspond to an early conception by Rosso. 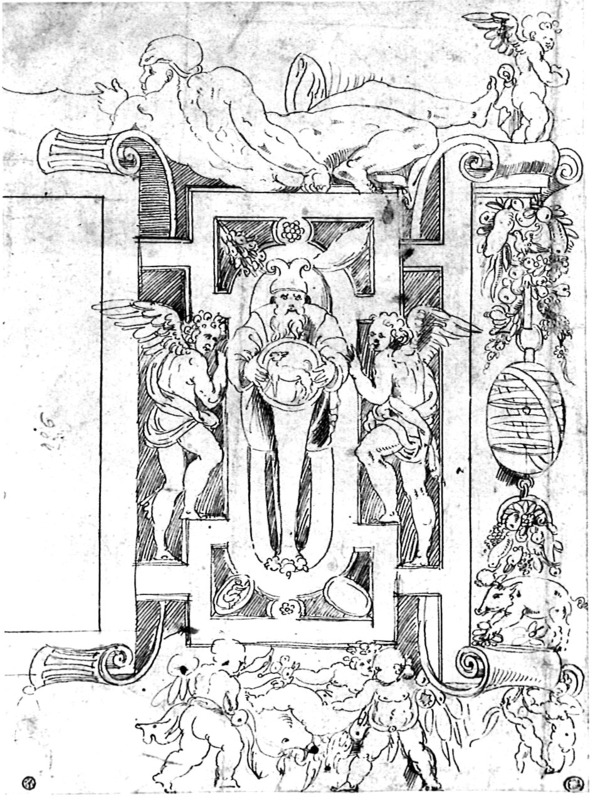 The drawing in Paris looks like the kind of copy that Fantuzzi might have made in preparation for his etching. The arch and stonework above the cartouche are at variance with the flat ceiling of the Gallery of Francis I. They may be included, in State II, simply to fill the otherwise unused upper part of the plate that Fantuzzi did not wish to cut off. 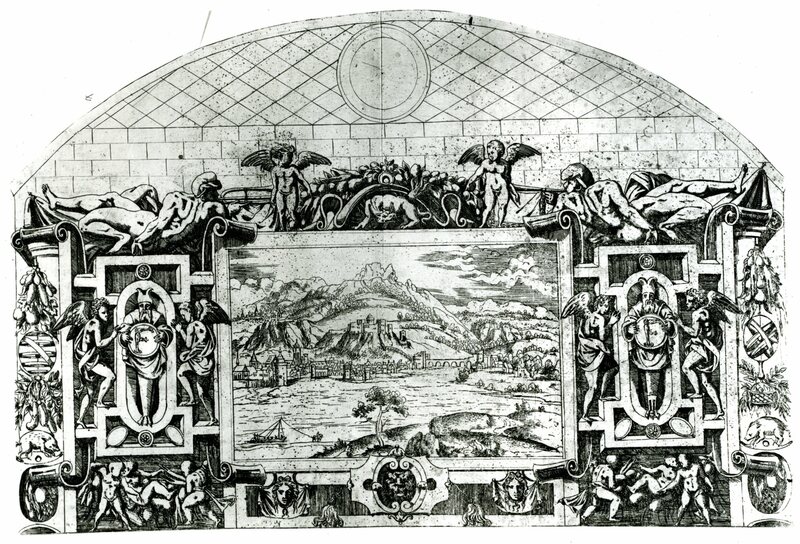 But the arched area may also indicate that the etcher did not actually know the Gallery of Francis I, and hence that the etching was not made at Fontainebleau. The other etching by Fantuzzi with a similar superstructure (Fig.RE.21) even goes farther in filling this area with figures and urns. COPY, PRINT: E.57,3. Du Cerceau, etching. Herbet, IV, 1900, 303-304 (1969, 153-154), VI (Petits Cartouches), 4. This etching is almost certainly copied, with variations, from Fantuzzi’s print.